The artist began work on this painting in 1865, but finished it only two years later, after his return from South America. During these two years, in the creative manner of Whistler, there have been significant changes. Before us is the last of Whistler’s portraits of Johanna Hiffernan, his model and mistress; After the return of the artist from Valparaiso, they parted. This picture, moreover, was for Whistler farewell to “japanism” – after 1867, the eastern motifs almost completely disappear from his work. The work also shows that by this time the influence on the artist’s painting of pre-Raphaelites has been weakened. If the first two “Symphonies” are full of symbolic overtones, then in this work the narrative element, by and large, is absent, which brings the picture closer to the work of aesthetic artists. In 1865, at an exhibition of the Royal Academy, Whistler got acquainted with the works of a prominent aesthetic artist Albert Moore and was delighted with his “Marble Bench”. The aestheticism of Moore makes itself felt in many Whistler things. Description and meaning of the painting Symphony in White No. 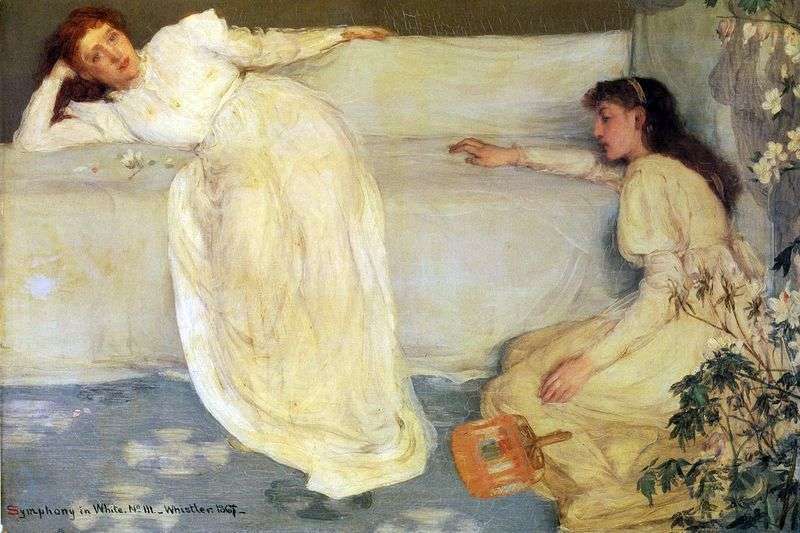 3 by James Whistler.